I have racked up a good few hours now in Titanfall, primarily on the Xbox 360, but after recently getting the Titanfall Xbox One bundle, I put a few hours into that to look for any differences and get my level where it should be. 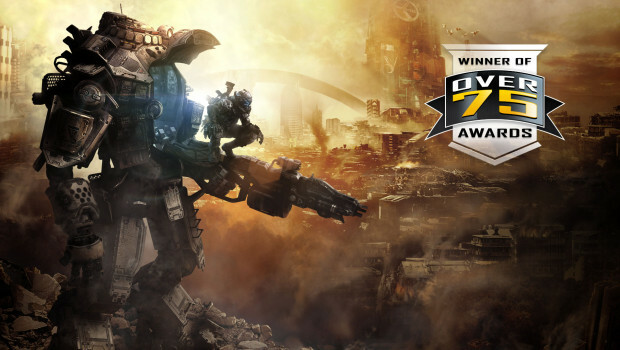 I should first of all start this article by saying that Titanfall is the new baby of ‘Respawn Entertainment’ which was founded by Jason West and Vince Zampella upon leaving Infinity Ward, where they were responsible for the creation of Call of Duty. 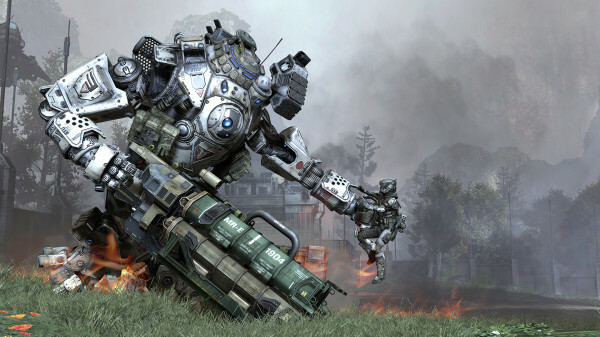 They have previously stated that Titanfall is currently, and will be in the forseeable future, an Xbox exclusive – I’m assuming the next one will be Xbox One only, with this one being an attempt to sell copies to the 80 million Xbox 360s that have been sold since it’s launch in 2005 – however there are rumours floating round now that it may not always be that way. The game consists entirely of multiplayer style matches, there is no ‘strict’ campaign as such, that other games of a similar stature have: Halo, Call of Duty and Gears of War etc. The loose ‘campaign’ – if you can even call it a campaign – is built upon the same maps as the multiplayer deathmatch game-types, but with a thin story giving background to the two teams involved – IMC and Militia. You play the campaign on both sides of the war, first as the IMC and later as the Militia, and you need to complete both sides to unlock the ‘Stryder’ and ‘Ogre’ titans – you get the Atlas as standard and as with many other games, you don’t have to complete the campaign – it shocks me how many people you see in Halo multiplayer who’ve never started the incredible campaigns. 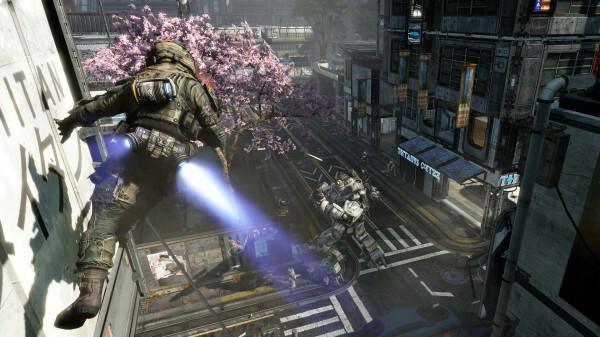 You play the game as a ‘Pilot’ on either side, but can call in ‘Titans’ to, fall (get it?) from space, you then pilot the death machines and attempt to wreak havoc. In my opinion this is a fantastic game, if not just for it’s visual and audible quality but also for it’s fun factor, with each match essentially consisting of up to 12 minutes rounds of pure ‘aaaaaargh’. 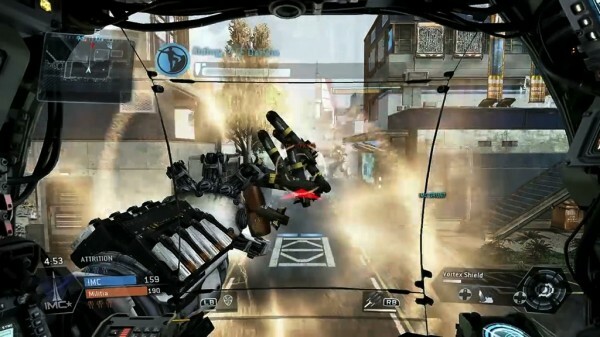 The gameplay is more similar to Call of Duty than any other video game series, even though it is very ‘space-agey’ ,don’t be expecting the, softer, Halo style of matchmaking, that involves giving everyone the same chance with an energy shield and the same weapons at the start, this is very obviously made by the creators of Call of Duty. 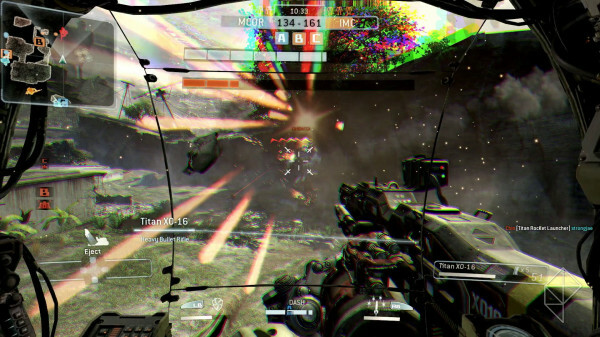 The killing is fast, very fast, and you only get a finite batch of health (this regenerates if hurt) but you don’t get a visual representation of that figure in a number or as a bar, but you do get a ‘red mist’ that fills the edges of the screen which many games before Titanfall have used – that’s nothing new. There are a couple of features that this game does better than many games have done before, the jump-packs and the wall running/parkour. These two features combined have blown the doors open in terms of map creation and accessibility, you can go basically anywhere that makes each map entirely multi-level and much more vertically open than any FPS game I’ve ever played before. A couple of taps of the A button and you are a floor above, another couple of taps and you can be on a roof, this game received next to no bad press before it’s launch (other than scepticism over the 360 port, as it was literally never mentioned or shown, not even who was doing it). I remember listening to the folks at IGN-UK on their podcast and Keza McDonald talking about how awesome the wall running is, exclaiming ‘It just works!’ and she is entirely right, just as Apple claim with their products, this game’s mechanics genuinely just work and it makes it all much more fun, you are able to hop around like a happy go lucky frog leaping from building to building looking for Titans to ‘rodeo’ (a pilot mounting the top of your titan) and pilots to shoot. The game has been built with a pretty good even-footing regardless of if you are in a Titan or just on the ground pounding the pavement on foot, you feel powerful as either. Neither is overpowered or underpowered, it’s fairly easy to kill pilots while in a Titan, but it’s also very possible to do the opposite; avoid the Titan and take it down as you are far more nimble on your feet than they are on theirs – but it is easy to get trod on if you aren’t careful. And with the mechanic of every pilot spawning with an anti-titan weapon of your choice (there’s four to choose from) you always have the ability to help take down, or even take out a titan or several titans yourself. A further Man Vs Titan equaliser is the ‘cloak’ ability making you invisible to Titans when you are not shooting, but not totally invisible to pilots. 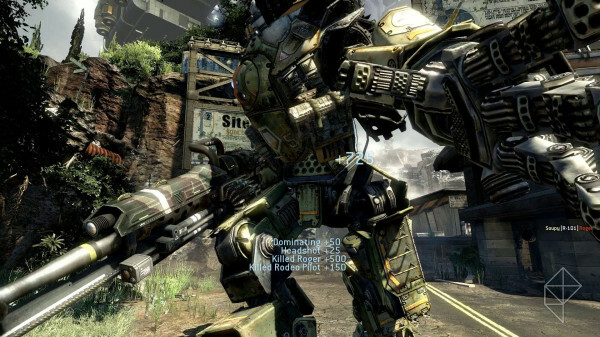 Respawn Entertainment have also managed to avoid facilitating the annoying habits of many CoD gamers: camping, going prone and sniping (one, two or all three of them make you very irritating). I believe this has been managed as the game is too much fun and too fast to just sit in a corner and snipe, or to camp, and with the inbuilt kill-cam (that you can choose to watch) camping is difficult as the recently deceased will know your vicinity once they die. I have tried sniping when I initially unlocked the first sniper-rifle – I do enjoy a bit of cold and calculated killing sometimes – but I got bored very fast and haven’t since. One very simple mechanic they’ve included that I don’t think i’ve ver seen before is that, regardless of the side you play on (IMC or Militia) your team is always blue, and the enemy is always red. I love this as a concept instead of having to get used to the enemy changing colour every game, like in Halo, or even worse in Battlefield and Call of Duty where every player is a shade of muddy grey/brown, you never have to think…always shoot at the reds. Beyond the gameplay, it’s structure is very similar to any other game that has involves levels, you gain XP with each match and for earning commendations (kill with this weapon X amount of times, run X amount of distance etc etc), but levelling is fast, very fast. On the 360 I reached the first ‘Regeneration’ level, which is achieved at level 50, within 98 games (Regeneration is the same idea as prestige mode in Call of Duty, your experience is restarted and all unlockables are locked again) this is an average of one level every two games; now I consider myself a good FPS player and can scramble to the top few players on a scoreboard nearly every game but that is insanely quick and this tells me something. The creators aren’t as interested in making people grind through level after level, but to instead play the game and have fun, the levels are just minor gateways to unlock items forcing you to try new items and abilities gradually, but quickly. This is unlike Halo Reach which required you to hit the daily cap of credits for around 100 days to reach their top rank, and as many of you may know, you don’t unlock anything useful in game with the Halo series, only armour to look different – and bragging rights obviously. I do however have some negatives about the game, and there always will be with every game, these are just my personal gripes with it. I dislike the pilot melee attack a lot, it’s called a jumpkick and kills any pilot in one go, it’s not a Game of Thrones ‘The Mountain’ style punch or a knife attack or a pistol whip, but just a kick. I personally find this too much, there is the alternative ‘assassination’ style of kill achieved from behind, but not by choice, it just happens like a short quicktime event, i’m ok with that being a one hit kill, but being kicked? I can only assume they didn’t want to have people in melee wars with each other, and onlookers to have the opportunity to pick them off, so they kept it fast and easy but i’m a big fan of the Halo style of ‘two hits on the front’ or ‘one hit in the back’ kills. Another issue is with two of the pilot weapons, firstly the R101C carbine, also your starting weapon, is too overpowered in my opinion, even just typing ‘Titanfall carbine’ into Google instantly gives me the suggestion ‘Titanfall carbine overpowered’, so I know I’m not the only one. It just kills too quickly, to a point where I’d not use other weapons if I was planning to be competitive, and didn’t want to complete the weapon challenges and have a bit of diversity. It’s very accurate, has a high damage, and a fast rate of fire, and after my quick Google, the silencer may not even reduce the bullets needed to kill – a deadly combination. Also the EVA-8 Shotgun is way overpowered, people run around with this and kill you from a distance that seem to be almost infallible distances to kill with a shotgun, and often generally don’t have time to fire off rounds with your own weapon to make a difference when pounced upon. I only use weapons like this when necessary as I like to game as a gentleman, but I used this to complete the requirements to proceed from Regeneration level one to level two, and I did too well for those games in question, typically hitting MVP (most valued player) or at least in the top three regularly with minimal deaths and believe this is too much and the kill distance needs shortening vastly. This may just be me and many people reading this may think I’m mad, but I dislike easy kills, I hate ‘quick-scoping’ and running around with a knife in Call of Duty, I hate camping, and basically any other ‘arsey’ tactic used to get one up over your opponent. In terms of image and audio quality difference between the Xbox 360 and Xbox One (I haven’t and won’t be playing on PC at any point) I would state that the game is better on the One (with audio allegedly taking up a quarter of processing power as it’s uncompressed). This difference was to be expected as it was originally designed for the One, which is a much more powerful system and only ported to the 360. The image quality is also slightly sharper on the One as expected but I find the black levels are a touch too dark, and with no gamma or brightness control in the menus you are stuck with this. As for frame size the 360 renders at 1040×600 and the One renders at 1408×792, which are both very strange resolutions to me and only the One edging past HD (1280×720)and neither anywhere near full HD (1920×1080) which the PC does achieve. Also the frame rate is much more consistent at reaching 60fps with the Xbox One, whereas with the 360 I regularly noticed frame rate dropping and frame tearing (caused by frame rate and refresh rate not matching) in near enough every match, it’s usually fine and playable, but the effect is noticeable; and in it’s defence has improved after the few updates the game has had. Lastly for audio, it is far superior on the One, the main thing I noticed was when you are rodeo’d you hear their footsteps clattering around your head on the One but i never heard on the 360, and I’m only playing with Logitech 2.1 stereo speakers for around £40, nothing expensive or amazing in quality; this may not seem like much but an extra few seconds to deal with them is nice. In retrospect though the game is excellent and I’d fully recommend anyone with an Xbox 360 or the Xbox One to buy it, or to buy an Xbox One in the Titanfall bundle, as the game is essentially free at that point. Each match boils down to 10 minutes of carnage, robots, parkour, bullets and many other things that would have many gamers bouncing up and down in glee – why wouldn’t you want that?